The CU/LASP-led mission to Mars, devoted to understanding the Martian upper atmosphere, reached a major milestone last week when it successfully completed its Mission Critical Design Review (CDR) at NASA’s Goddard Space Flight Center in Greenbelt, Maryland. An independent review board, comprised of reviewers from NASA and several external organizations, met from July 11-15 to validate the system design of the Mars Atmosphere and Volatile Evolution, or MAVEN, mission. The CDR bridges the design and manufacturing stages of a project. A successful review means that the design is validated and will meet its requirements, is backed up with solid analysis and documentation, and has been proven to be safe. Completing the CDR grants permission to the mission team to begin manufacturing hardware. The goal of MAVEN is to determine the role that loss of atmospheric gas to space played in changing the Martian climate through time. MAVEN will determine how much of the Martian atmosphere has been lost over time by measuring the current rate of escape to space and gathering enough information about the relevant processes to allow extrapolation backward in time. LASP is leading the mission, which will carry three instrument suites to probe the atmosphere of Mars and its interactions with the sun. 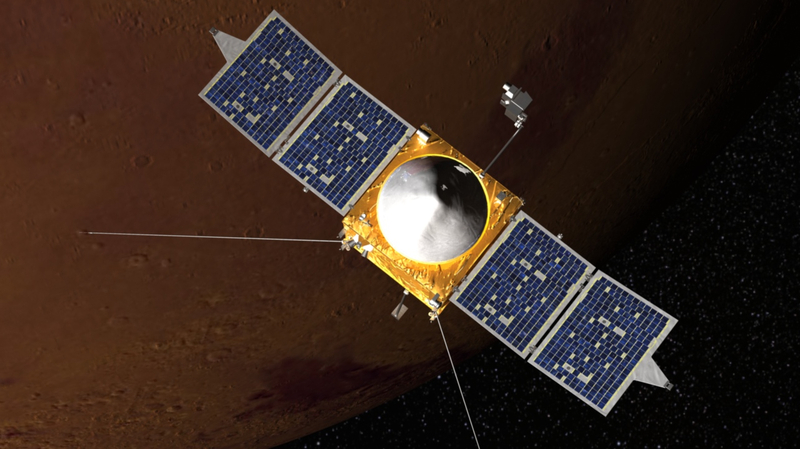 LASP Associate Director and CU professor Bruce Jakosky is the principal investigator for MAVEN. “The Critical Design Review is a real benchmark for the MAVEN team as we progress toward launch,” said Jakosky. “We are on schedule and on track, which is good news and a tribute to the hard work by all of the MAVEN team members.” MAVEN is scheduled to launch in late November, 2013. The three instrument suites on MAVEN will include a remote sensing package, built by LASP, that will determine global characteristics of the upper atmosphere and ionosphere. The MAVEN science team includes three LASP scientists heading up instrument teams—Nick Schneider, Robert Ergun, and Frank Eparvier—as well as a large supporting team of scientists, engineers and missions operations specialists. The LASP team will also provide science operations, build two of the science instruments and lead education and public outreach efforts for the MAVEN mission. NASA Goddard is managing the project and Lockheed Martin, based in Littleton, Colorado, is building the spacecraft. The MAVEN effort also includes participation by a number of CU graduate and undergraduate students. Currently there are more than 100 students working on research projects at LASP, which provides training for future careers as engineers and scientists.